RIO DE JANEIRO, BRAZIL – Leblon, the Rio neighborhood that is almost impossible to mention without the accompanying prefix ‘exclusive’, originally took its name from the successful French businessman Charles Le Blond, who owned the land back in the 19th Century. The largely residential region stretches along 1.3km of stunning beach, and contains some of the most expensive real estate to be found anywhere on the continent. One of Leblon’s most exclusive penthouses offers views to Cristo and the beach from Rua João Lira, photo courtesy of Indigo Invest. Leblon also marks the western edge of Zona Sul, a miniature Ipanema of sorts (its small dimensions adding to its allure) with a disproportionate number of excellent restaurants for its size, most of which can be found along Rua Dias Ferreira. The area known as Alto Leblon, meanwhile, is an entirely residential hillside affording impressive views across the beach, alongside the ultra-exclusive Jardim Pernambuco, where high walls hide enormous houses owned by musicians, TV stars and politicians. Shopping options are in abundance, too. Rio Design Leblon is one of two malls (the other being Shopping Leblon) that offer a high-end retail experience, chock-full with designer stores and nice touches that include a bilingual concierge and even a library for regular customers. 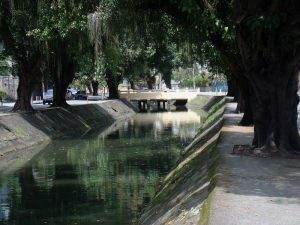 The Visconde de Albuquerque canal exemplifies the tranquility of Leblon’s tree-lined streets, photo by Rodrigo Soldon/Flickr Creative Commons License. A Friday afternoon stroll provides a glimpse into the Leblon lifestyle. The transition from Ipanema is evidenced by more than just a canal; it is immediately clear that fewer tourists venture as far as Posto 11. Instead, the tranquil, tree-lined streets are filled with well-dressed locals pushing strollers and walking their dogs, belying the high concentration of families residing here. This idyllic lifestyle does not come without a hefty price tag though. Buying and rental prices have reached unprecedented heights in recent years, outstripping other parts that have also witnessed the boom first hand. However, recent months have seen the market slowing, with prices hitting R$22,000 per meter square according to industry experts Secovi-RJ. That huge figure accounts for much of the cooling off in the number of sales in recent months, and less movement in the market as a whole. 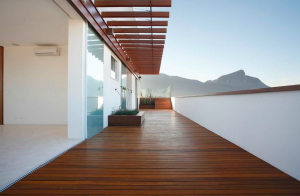 Rental prices in Leblon for August were down slightly to R$67 per square meter against June’s R$70, but still show an increase of four percent over the course of 2013. Yet it remains a very exclusive and traditional neighborhood, with properties that have been in families since being built and where many renters, except the wealthy, are largely priced out of the market.